So we start out with Rey falling on her hands and knees struggling to catch her breath. Next we see a strange looking planet with even weirder looking ships that are flying towards what I think are Imperial walkers with large poles into the ground, causing red smoke to go everywhere. Then we cut to Finn looking like he’s in a recovery pod, or something. Next, Poe runs alongside BB-8 into a large hanger where everything is exploding, and it looks like his ship is exploding too. And then there’s the Millennium Falcon shooting down TIE Fighters. 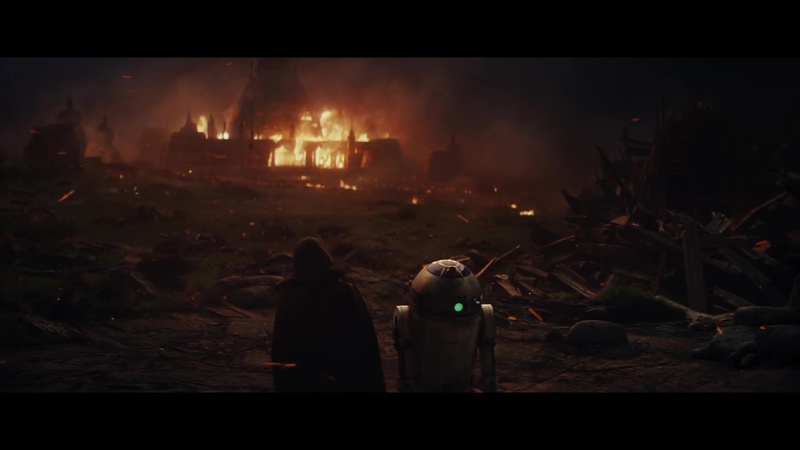 Next, Rey is running at night with her lightsaber then turning to Kylo Ren as Luke says, “I only know one truth.” We see Luke fall to his knees next to R2-D2 as he watches a building burning down. So there you have it! I really want to see Rey’s origins revealed in The Last Jedi, as well as Supreme Leader Snoke’s. And what about Luke’s Academy? That has to be explained as well. Is there anything you’d like to point out about this trailer? You can tell me in the comments.